The successive governments’ decision to expand monoculture for the production of biofuels is one of the drivers behind the development plan. One month after the farming community of Las Pavas returned home, having lost patience with the legal process, Colombia’s Constitutional Court ordered that their rights to land should be guaranteed. On 6 May 2011, the 123 families of the Las Pavas farming community received the long awaited news from the Constitutional Court that the actions leading to their forcible eviction in 2009 had been illegal and ordered that the Colombian government should guarantee their rights to land. The sentence (T-267 of 2011) obliges the Colombian government to re-open the process that the community began in 2006 to have their legal claim on the land acknowledged. The Court also declared that the families cannot be evicted from the Las Pavas Ranch (Hacienda de Las Pavas) until the process to establish ownership has been finalised. 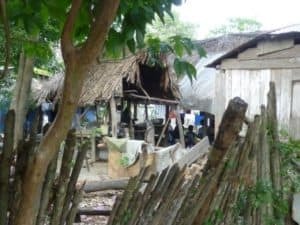 This welcome news follows shortly after the community decided that they could no longer wait for the legal process to rule in their favour and returned to their lands on the Las Pavas Ranch, from which Colombian police had forcibly evicted them two years ago. We are very happy, because without land we are nothing. It’s not just about working on the land; we want to restore our territory, environment and culture. This is what we are fighting for. In 2003, following threats from paramilitaries, the peasant farmers of La Hacienda de Las Pavas (Las Pavas) were forced to abandon the land on which they lived returning only in 2006 when they thought it was safe to do so. In mid-2006, the community, through their co-operative (La Asociación de Campesinos de Buenos Aires – ASOCAB), submitted their legal claim to the land in accordance with Colombian law, thus seeking to resist further displacement. As part of this process Colombia’s Rural Development Institute – INCODER visited Las Pavas in June and confirmed that the land was being worked by the community. However, later that same year the community suffered another violent displacement by the paramilitaries once again losing their crops, their animals and their livelihoods. Meanwhile in 2006, but subsequent to the farmers’ ownership application, a palm oil consortium consisting of C.I San Isidro and C.I Tequendama S.A (a subsidiary of the DAABON Group) sought to purchase 5 plots of land totalling 1800 hectares in the Hacienda de Las Pavas. At this time, the state authorities did not do anything to prevent the purchase of the land by DAABON, in 2007, despite the ongoing process of registration of the same land to the families of the Las Pavas. Meanwhile, heavy rain caused flooding in the small village of Buenos Aires (Department of Bolívar), where the displaced families were living on the edge of their territory. The floods destroyed their crops and the community found themselves facing a food security crisis. Once the flooding passed they decided that they could no longer await an official decision on their land claim and returned to Las Pavas in January 2009 in order to once again begin planting their crops. However, the farmers were subsequently forcibly evicted from their land by the Colombian police in July 2009, leaving them no time to harvest their crops, which were destroyed in the process. The police informed the community that they were acting with a mandate from the local authorities based on a demand made by palm companies to restore their rights to property. It was an illegal eviction because they did not take into account the claim on the land made by the peasants. In September 2009, following a request by ASOCAB, Colombia’s Constitutional Court began the process of reviewing the communities’ land title claim. During 2010, the community remained displaced and the palm companies continued to make productive use of the land. visited the land with the community in order to mark out the disputed territory, under the auspices of Plan de Choque (the first step in the Santos administration’s public policies on land and rural development under which the government planned to restore 500,000 hectares of land to victims of forced displacement between October 2010 and April 2011). As the Las Pavas community members moved around the area they noted a number of nurseries with hundreds of palm plants ready to plant out. Despite the official recognition that the Las Pavas community were victims of the Colombian conflict (under Plan de Choque), tired of waiting for the outcome of the legal process to rule in their favour, and faced with an increasing food security crisis the community decided to return to Las Pavas on 4 April 2011. Two hundred peasant farmers, accompanied by PDPMM, a number of other organisations and 45 members of the Indigenous Guard of Northern Cauca, began the process of their return; building houses, installing sanitation, digging water wells and marking out areas to being to plant their crops. Heavy flooding in the region devastated the homes and crops of the community, living in Buenos Aires, in December 2010; and again on their return to Las Pavas in April 2011. ABColombia member Christian Aid discovered that Daabon was a supplier of palm oil to The Body Shop. Upon hearing about the situation in Las Pavas, The Body Shop, an ethical company which supports small farmers, agreed to co-finance an independent review (here in Spanish) into the case. The review revealed that Daabon had no excuse for being ignorant of the legal dispute surrounding the ownership of the land at Las Pavas. The Body Shop, in fairness to Daabon, allowed them two months to contact the farmers and begin to negotiate a se ttlement; something that Daabon made no attempt to do. This led to The Body Shop ceasing its trading relationship with Daabon. Bolívar is the department with the highest number of wetlands in the country. Standards dictate that wetlands and marshland should be considered areas of special environmental importance and as a consequence must be protected. Their use should ensure the conservation of ecosystems. The Municipality El Peñón (where the Las Pavas Ranch is situated) is located between the River Magdalena and El Brazo Papayal. The flood plain is prone to flooding from heavy rains and overflowing river banks. The flood plain is also what defines the richness and diversity of the regional ecosystem, where the greatest biodiversity of flora and fauna species can be found. The eco-systems on the Las Pavas ranch are still in a good state of conservation, principally due to the farmers’ knowledge and assessment of their environment. Before their repeated displacement, the 123 families of Las Pavas managed a complete ecosystem to the benefit of the entire community. The community are hoping that this ecosystem will once again flourish now that they are back on their land. Report: Independent Commission, Land Conflict -Las Pavas-Bolívar, Colombia: INDEPENDENT EVALUATION OF THE LAND CONFLICT IN LAS PAVAS (BOLIVAR, COLOMBIA), June 2010 (Report commissioned by the Body Shop and Christian Aid).